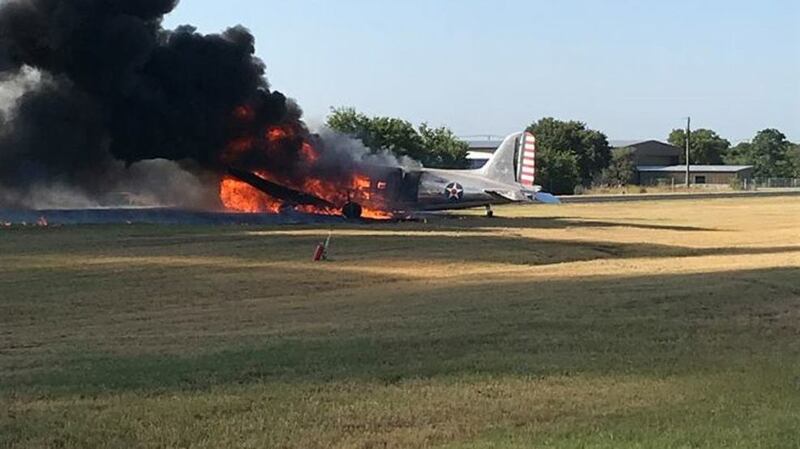 A Douglas C-47, named "Bluebonnet Belle", was involved in an accident during takeoff from runway 19 at Burnet Municipal Airport, Texas, USA. 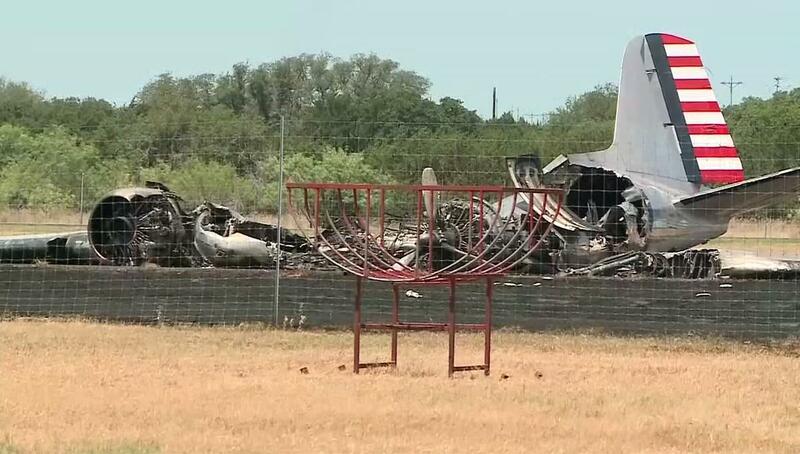 The aircraft came to rest in the grass next to the runway and burst into flames. 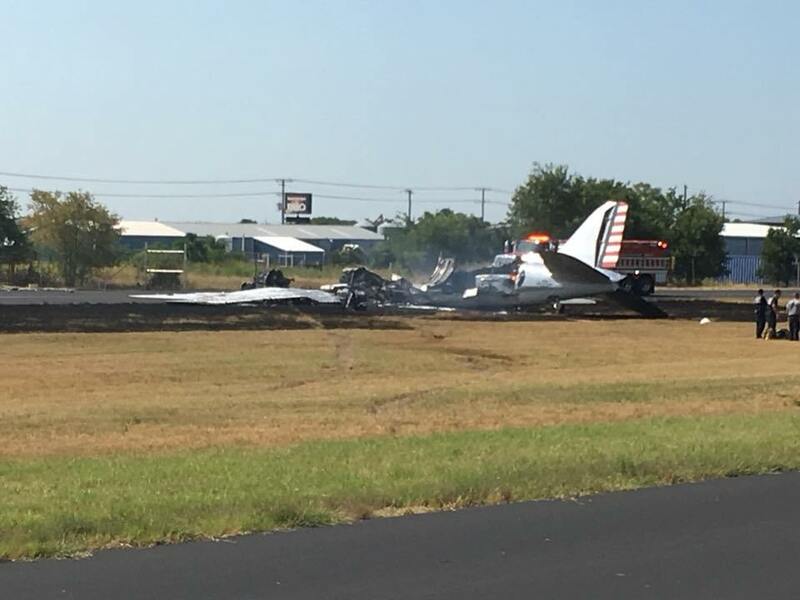 The captain, crew chief, and 4 passengers sustained serious injuries, 1 passenger sustained minor injuries, and the co-pilot and 5 passengers were not injured. 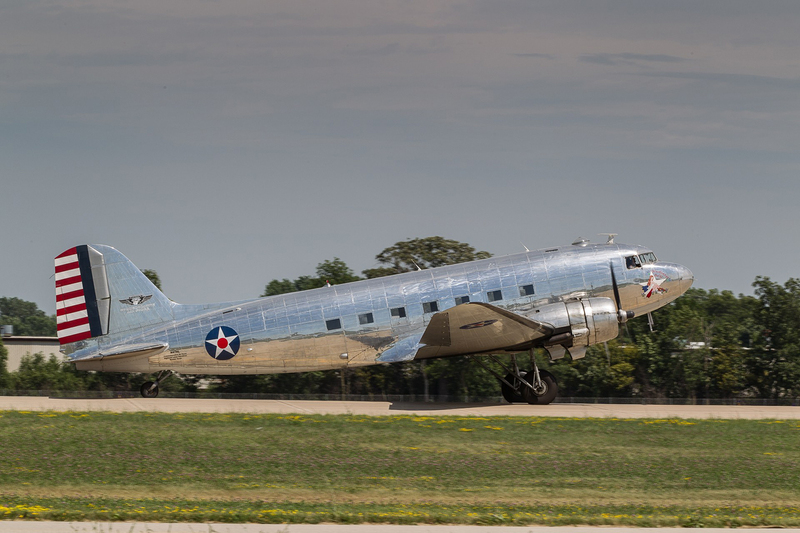 The aircraft was to be flown to a fly-in at Oshkosh, Wisconsin. The co-pilot, who was the flying pilot reported that prior to the flight, it was briefed that he would perform the takeoff. He stated that the captain taxied the airplane to the runup area, where all pre-takeoff checks were completed; the captain then taxied the airplane onto runway 19. The co-pilot further stated that he then took control of the airplane, provided a pre-takeoff brief, and initiated the takeoff sequence. About 10 seconds into the takeoff roll, the airplane drifted right, at which time he applied left rudder input. This was followed shortly by the captain saying that he had the airplane. The captain, who was the non-flying pilot, reported to the NTSB that during the initial stages of the takeoff roll, he didn't recall the airplane swerving to the right, however, recalled telling the co-pilot not to push the tail up because it was heavy; he also remembered the airplane swerving to the left shortly thereafter. The captain stated that he yelled "right rudder" three times before taking control of the airplane. He said that as he put his hands on the control yoke, he noticed that either the tail started to come down or the main wheels were either light or were just coming off the ground as it exited the left side of the runway. The captain said that he knew the airplane was slow as he tried to ease it over [to the runway] and set it back down. Subsequently, he felt the 'shutter of a stall," and the airplane turned to the left and impacted the ground. After the airplane came to a stop, a post impact fire ensued, during which all the occupants of the airplane egressed through the aft left door. A video of the takeoff and accident sequence shows the aircraft accelerating on the runway, with the tailwheel leaving the ground very briefly. A few seconds after the tailwheel touched down again, the aircraft seems to drift off the left side of the runway. The aircraft banks right, causing the left hand main landing gear to become airborne. The right hand wing tip touched or almost touched the ground before the aircraft became airborne. The left wing dropped and the wing tip touched the ground, causing the plane to slew to the left and touch down again. The right hand main gear then seems to fold as the aircraft comes to rest in a cloud of dust. Examination of the accident site revealed that the airplane came to rest upright on a heading of about 113° magnetic, about 145 ft east of the left side, and 2,638 ft from the approach end of runway 19. The post impact fire consumed the fuselage from the nose cone aft to about 3 ft forward of the left side cargo door along with a majority of the wing center section. No evidence of any flight control locks was found installed. The tailwheel locking pin was found in place and was sheered into multiple pieces. Vegetation (grass) within about 200 ft of the main wreckage was burnt from the post impact fire. The wreckage was recovered to a secure location for further examination.